The future of Peterborough Panthers appears to have been plunged into serious doubt again. Promoter Ged Rathbone has threatened to pull out of speedway after seeing the major capture of top British star Craig Cook blocked by the sport’s governing body. 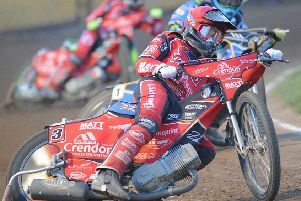 He revealed the British Speedway Promoters’ Association (BSPA) have ruled that the city club’s swoop for Cook and local lad Tom Stokes to replace two Danish riders, Nicklas Porsing and Michael Palm Toft, is not in the best interests of the sport. In a lengthy and strongly-worded club statement, Rathbone stresses that a failure to overturn the decision could lead to him walking away after the club’s next two fixtures – a trip to Plymouth tonight (May 6, 7.15pm) and home clash against Sheffield on Sunday (5pm), when the changes were due to take effect. Rathbone said: “The BSPA have told me it is not in the best interests of the sport to allow our signing of two British riders to go through - and that is something I find completely and utterly staggering. “I’m completely disillusioned as to how we can be blocked from bringing one of the finest British riders in Craig Cook and an up-and-coming British talent in Tom Stokes into a British team in a British league when we have broken no rules. “There is absolutely nothing in the sport’s rulebook to suggest that this move cannot happen and the BSPA have failed to prove otherwise by providing me with such a ruling. “I’m told the management committee do not want a rider to double-up between two teams with the same race-night either - even though we have only a handful of Friday fixtures and there were only three clashes between ourselves and Craig’s Elite League club, Belle Vue. “Using a guest on those three occasions was a perfectly acceptable scenario for both ourselves and Craig, who had jumped at the chance to return to racing in the Premier League. He is already in the process of having equipment brought back to the UK from Poland to facilitate this move. “I’ve also been informed that Belle Vue were not in a position to give us permission to speak to the rider - something they did grant to my co-promoter Trevor Swales when he made contact with them. “I’ve had messages of support from other Premier League promoters telling us what a great move we have made - not just for Peterborough but for the whole of British speedway by bringing Craig back into the league - yet now we find our plans scuppered. “Craig was runner-up in the British Final last summer and would have won the title had the final race not been stopped. “With champion Tai Woffinden choosing not to ride in this country, Craig is now technically the best Brit actually racing in Britain. “I’ve worked tirelessly since late in 2014 to bring stability and success to Peterborough. I cannot contemplate being in a position where our crowd levels drop, something I believe could happen after our poor recent form. “That is why I decided to act and make the exciting changes to create what we all want and what our paying supporters expect - a winning team. “At this moment in time, I’m committed to completing our away meeting at Plymouth and the home fixture against Sheffield, but I will be seriously considering my future in the sport beyond that. But BSPA Vice Chairman Rob Godfrey denied there was a vendetta against Panthers. He said: “I personally advised Ged Rathbone before the announcement of the proposed team changes were made that this move would probably not be approved. “There is no way a rider signing for two clubs who have declared the same race night - Belle Vue on a Friday and Peterborough the same - would be approved. Middlesbrough-based businessman Rathbone has breathed new life into Panthers since leading a huge fight to save the club from possible oblivion in late 2014. The club reached the Premier League play-offs semi-finals last season despite a catalogue of serious injury problems and are determined to challenge for honours again this season. Newly-appointed team manager Jason Attwood is due to take charge of Panthers for the first time tonight. Palm Toft makes what looked like being a farewell appearance for the club at the St Boniface Arena whereas the other axed rider, Porsing, is out with knee trouble and will be covered by the rider replacement facility. But their futures are suddenly now unclear after the BSPA block on the signings of Cook and Stokes. Plymouth have two riders missing tonight after number one Charlie Gjedde quit British speedway yesterday – rider replacement is now in operation. They are also without the injured Kyle Newman for whom Kevin Doolan of Berwick takes a guest booking.